Some great Astros cards, lots of Oswalt, Berkman and Biggio! Josh Anderson relic, we sent him to the Braves a few years back in exchange for Oscar Villareal (I think). Anyways, don't know what he's up to now. 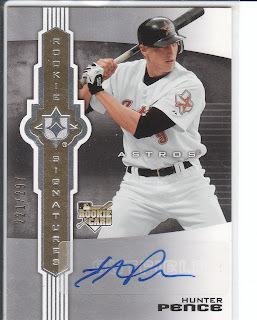 Also, I got this bad boy from Topps via redemption from a box of 2010 Chrome that I won! The penny sleeve looked like a toddler chewed on it, but the card is great! 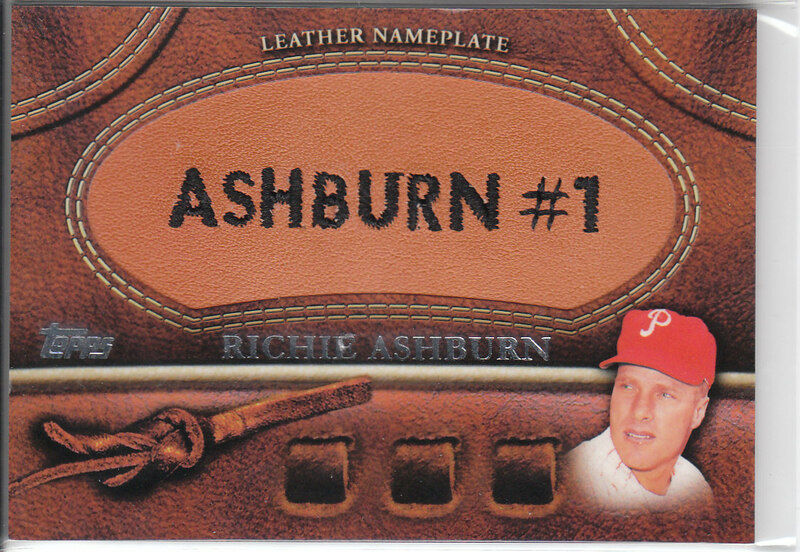 It's reserved for David over at Rhubarb Runner, if he ever pulls another Astro card! Haha! If anyone wants to put a multi-blogger trade together, I'm sure David wouldn't mind... I'm holding quite a few Twins auto's hostage at the moment! Have a great week everyone, I'll see you all again from Alabama! If anyone wants/needs my new address, comment here, and I'll reply with my updated address! Thanks everyone! So I'm posting this from our laptop... as my PC crashed today and is at the doctor's office getting a new hard drive and *CROSS YOUR FINGERS* a hard drive recovery. If the hard drive recovery doesn't work, I might cry. Streams of tears... Apparently there was a power surge at the house today while I was at work. The hard drive just clicked and clicked when I booted up the computer. What does this mean to you? No scans or pictures for a few days on this blog, although my posting will be EXTREMELY SPORADIC the next week or two as we FINALLY move to Alabama. For those of you working on trades with me via e-mail, please be patient. I've reserved cards for people and I'm probably going to hold off all shipping until after we're in Alabama. If you're planning on sending me something, PLEASE check with me first as I can give you my new address. Mike @ B.A. Benny's Baseball Card Buffet, I got your package in the mail today.... AWESOME CARDS! I will get a post up as soon as I get a functioning computer back in the house that I can hook my scanner up to. A virtual/real trade with Brian and a Box BREAK!!! Gretchen Bleiler is a snowboarder and guys if you haven't seen her FHM spread, well you are missing out. A sloppy but cool auto from an oddball sport. Next is Igor Larionov... apparently a hockey star from the 80's but what a sweet patch! I wonder if it's from a Red Wings jersey or a USSR jersey, either way it's a great card for you hockey collectors out there! And finally we have Texas boy Hunter Mahan who is still early in his PGA career. This may be a card to sit on, wait and hope he really starts playing well. Another cool brightly colored swatch. These are for trade, but the Bleiler auto might be hard to get out of my collection! Yes, that is THE Louis Vitton, the namesake of those overpriced pieces of garbage purses that are all the rave. My favorite of the bunch is the "Gentleman" Jim Corbett mini. The foil mini's are great. Delino DeShields mini is cool, not sure if that's Sr. or Jr., but I know Jr. is in the Astros AA Support Group minor league system right now. I really like the look of these mini's and the set in general. 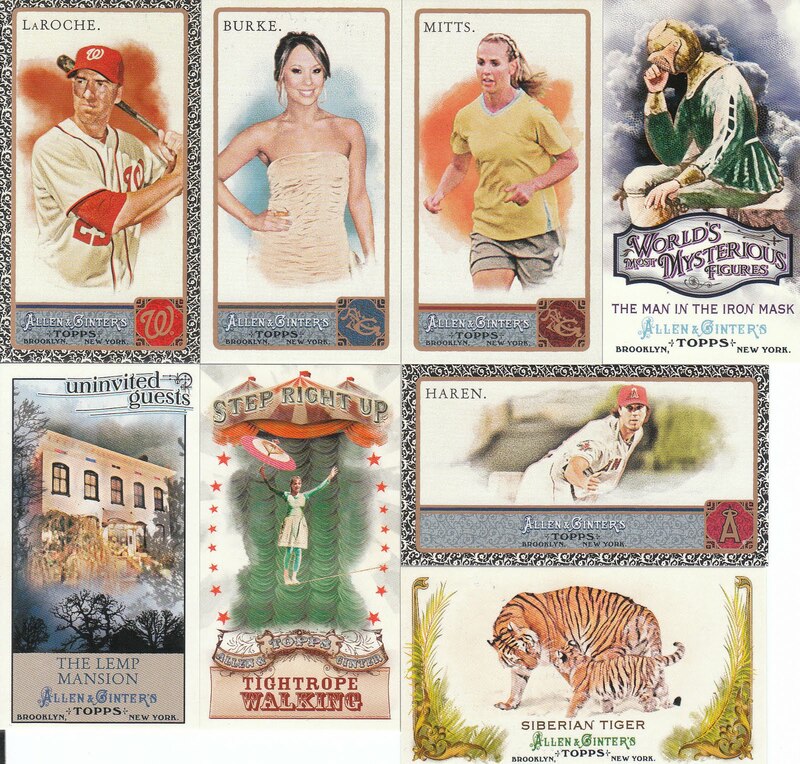 I like the die cut inserts and really like the varied list of relic and autograph subjects. I really would have liked to break this via video, however it's packed at them moment... t-minus 8 days until we're living in Alabama! That Gorilla patch may fetch me a couple hundred bucks on eBay if my research is correct. VERY cool cards, even if I had gotten one of the lesser seeded cards, these are how patches should be done. Natalie Gulbis is a popular women's golfer so I may be able to trade her card for a baseball relic I'd want, and the auto, well I had never heard of her before but apparently she's the first woman in the hockey Hall of Fame so maybe there's a hockey collector out there who'd want to trade for it. For those of you scratching your heads, wondering what this is, it's a Die Cut card exclusive from the Topps Website as part of the Diamond Topps code cards. Have Pence in hand, I REALLY want the Brett Wallace one now... and I can't wait to order my Nolan Ryan that I've already traded for! Awesome stuff, thanks Jeff! If he contacts any of you about a trade, go for it because he's an AWESOME trader! Well, I got a package in the mail today from Mr. Napkin Doon. And it's awesome, but the bad part that I've failed to get his package out in the mail yet this week. I know, I'm a horrible person... Napkin, your cards will be headed out soon, as well as Mr. BA Benny and Jeff W. A post office trip is scheduled!!!! But here's the cards anyways! So I won me a nice little contest over at Play At The Plate the other day and got my contest winnings in the mail today... 3 packs of Topps Series 2 and some nice Astros. I knocked off one card from my set need list and 1 mini from my Kimball Champions need list. I also go a diamond code card and got a ring I needed and a 1973 Freddie Patek card that has a sweet action photo of Freddie turning a double play! 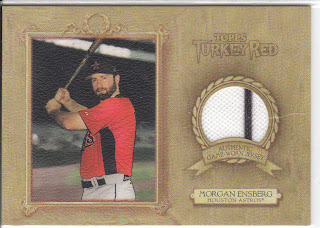 Below are the inserts that I pulled, the Astros and the cards that I was able to cross off my want list. Thanks Brian for another great contest! I scanned the back of the "original back" Dale Murphy Topps 60 card... that Berkman rookie is pretty cool. 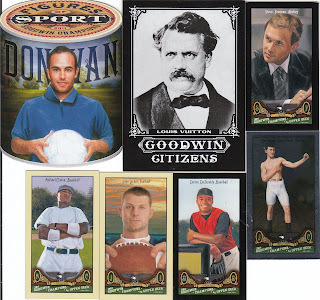 I've been pretty intrigued with a series of posts over at I Am Joe Collector as he works to expose a autograph faker. That Evan Longoria "auto" that he pulled from Masterpieces is AMAZING and that post really put a smile on my face. Always good to see a good guy go after these complete idiots on eBay trying to pass of autographs onto unsuspecting fans. 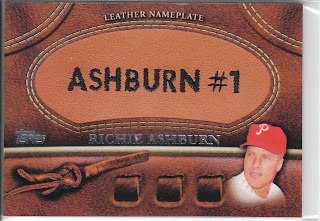 This is why I tend to avoid autos on eBay unless I can see the back of the card and it either has the correct wording, or a serial number I can verify with the manufacturer. Keep up the good work there Mr. Joe Collector. His posts really help remind me to be wary of things that look too good to be true. I've signed up for Gint-a-Cuffs III. I need to get my box ordered, but I need to wait and get some funds. There's also the sticky situation of moving. If the product releases at mid-month, then I don't know if it'll get here in time before I move to Alabama on the 29th. I may just have to wait and order it once I get to Alabama. 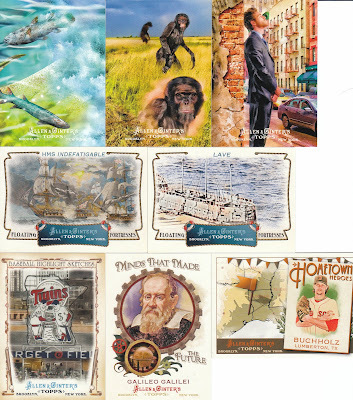 I'm really looking forward to A&G this year, I really like the design and am really excited about the many new inserts this year. 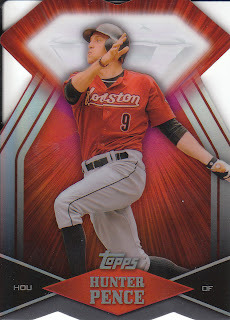 I think I'll go after the base set again w/ SP's and then maybe pick 1 or 2 mini sub-sets to go after. 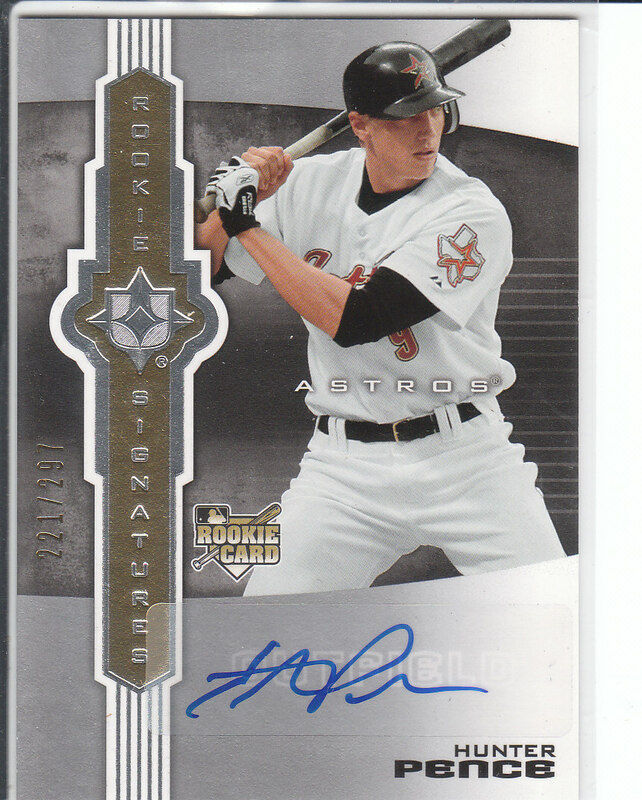 Of course I'll try to pull as many Astros variations and inserts as possible, hopefully there are more Hunter Pence cards than Carlos Lee this year. Well, hope you all are having a great week. Sorry for the lack of posts lately, let me know if you have any topics that you'd like me to give my insight on. Any reader who submits a topic, I will address it in some way or form, no matter how ridiculous... ok, well, just keep it appropriate people, hobby-related preferred... but if you really want my opinion on the feminist movement arising from the French Revolution then well, you'll get a paragraph of my insanity, as my opinion on such a topic will be non-nonsensical. Ask away! 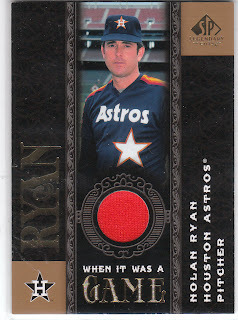 The middle Berkman is numbered 98/99 and I'm about 99% certain that patch is from his numbering, it's a sweet patch. 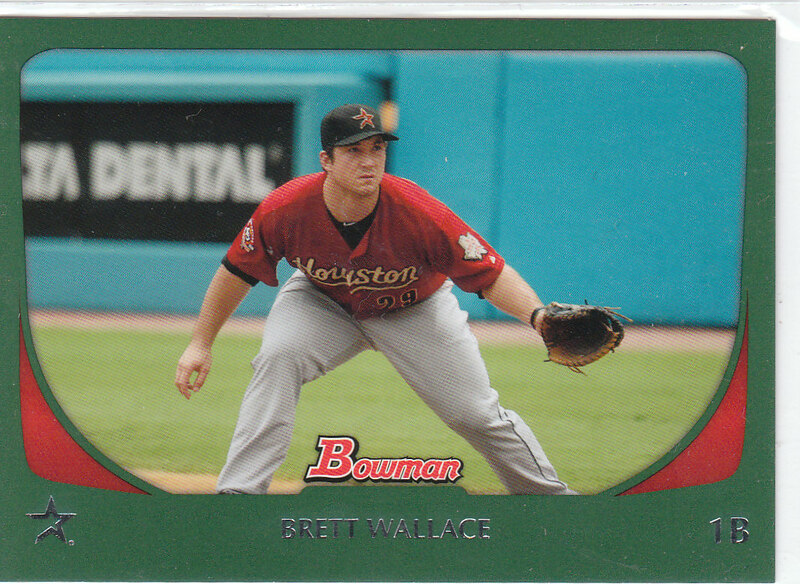 The only other serial numbered card is the Berkman on the right which is 257/500. The Oswalt game used bat is kinda cool because usually you don't get pitchers' bats, and the 2008 Topps "2007 Highlights" card has a pretty sweet pinstripe. 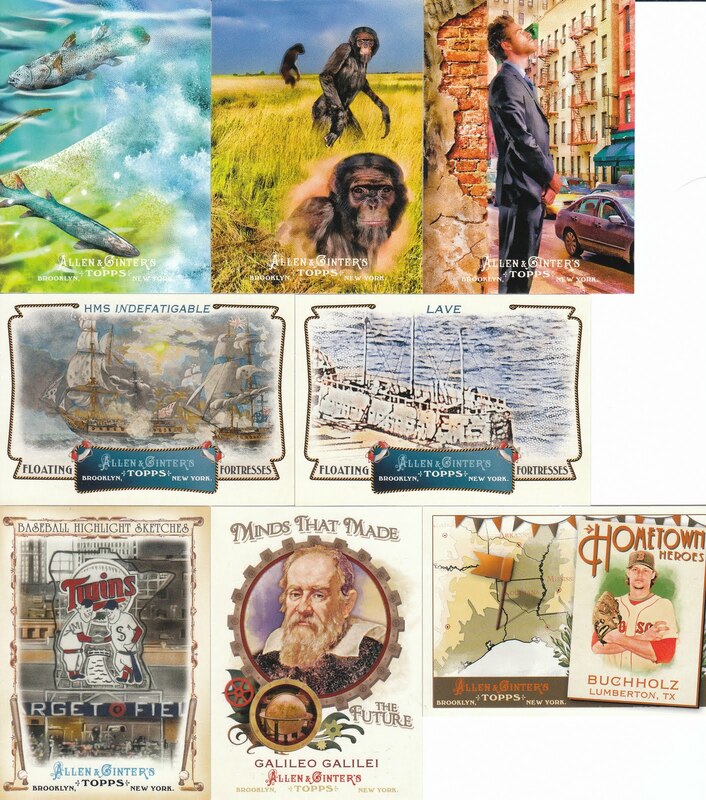 Head on over there and check out what he's got, some great cards! 1) Dennis at Too Many Grandersons - I'm holding a Rich Hill 2007 UD Masterpieces Auto for you. 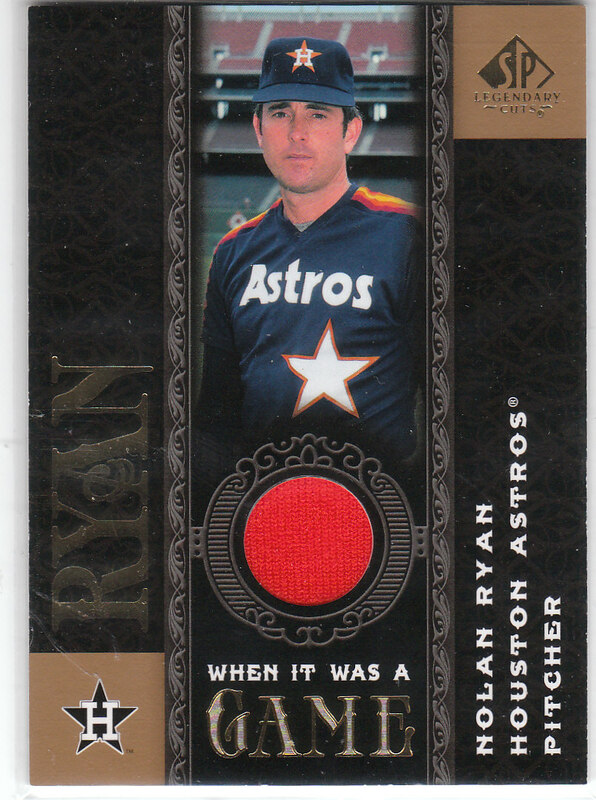 3) Nakpin at The Adventures of Napkin Doon - I am holding a Michael Young dual relic for you. 4) Johnny at Cards from the Quarry - I am holding a 2010 Topps Chrome Eric Young Jr. auto. I think we both forgot about this one. 5) Cam at The Bullpen Cardboard - I am holding a J.R. Towles auto for you. 6) Adam E. at Thoughts and Sox - I am holding a few GQ Red Sox mini's and a GQ Green border for you. 7) Phillip at PAW's Dugout SportsCards - I know we're working out a deal involving the GQ stuff you have for me, and the Duvall auto and others you may want. 8) Mike at BA Benny's Baseball Card Buffet - I am holding a MEGA DEAL for you, including your group break cards. I think I may go ahead and ship this, as I cannot put any more cards into this box and I need to get my desk cleared! 9) Tim at Better Luck Next Pack - I know we're working on a deal that involves your Nachos Grande group break Astros cards. I've pulled some cards for you (UD Masterpieces and X) and may include a couple of Indians jersey cards as this group break goes along. This may be the one trade that lingers into August, but we'll just see what we can do before then. Alright, those are the only 9 deals I show as pending. If we have something pending and I forgot it, let me know and I'll add it to the list. If I owe any of you anything and you're not on this list, please e-mail me and we'll talk it over. I want to get all these cleared out before July 15th if possible. Hopefully I can get everything posted before I head out and that there isn't a huge lag between blog posts once we get to actually moving. At some point I'll let you all know my new address. Have a great July 4th weekend everyone.